Technology may be revolutionizing the healthcare industry but while mobile health applications and cloud-based management are convenient, many think they may be compromising the privacy of healthcare data. The debate, which is so multifaceted there isn’t one way of looking at it, centers around how the healthcare industry can embrace mobile health while still securing patient data. In light of the Anthem breach earlier this year, the issue is becoming even more of a hot topic. Still as much as people may want for more convenient, do-it-yourself methods from their providers, PWC reports they still are very hesitant about giving up that data. See the data from the PWC report below. 1. Key a close eye on data and watch for internal and external threats. Hire cyber security and keep the right safeguards in place. 2. Know your data. Keep a record of all devices that record patient data and make sure they are safeguarded properly. 3. Look to other industries. Learning how banks or financial institution safeguard data and work with mobile applications could be helpful to moving forward. We know this issue won’t be settled easily but here is some food for thought. In interview with MedCity News, Robert Neivert of Private Me (consumer privacy company) brought up the idea “both government and healthcare should take a chapter out of the online banking sector by adopting closed-network systems.” Could this be the solution or will this still sacrifice convenience? Tell us what you think. 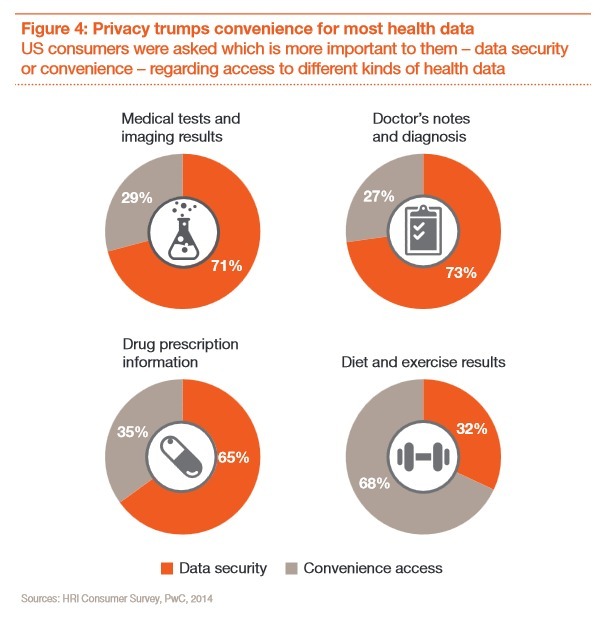 Can the healthcare industry properly balance convenience and privacy in the digital age?